In a digital world full of strong competition and daily tournaments for the highest rankings and the lowest number of hits taken to budgets, a war of attrition, we find a group of highly skilled publishers known to the world as affiliates who battle outside the realm of PPC, SEO and Display. There are many varied affiliate types, with a plethora of skills and promotional techniques to drive brand awareness, traffic and conversions. Below is an overview of the strengths, characteristics, payment models and benefits of the most popular publishers fighting it out in the digital industry. Round One. FIGHT! Fighting Style: First introducing Content, this contender is an upper funnel, highly versatile specialist, and can deliver an air spinning bird kick of broad content topics. Whether it be the latest gadget reviews, the top 10 places to book your Christmas holiday or the best place to buy a cronut in East London, this publisher type will add affiliate links to their articles, can review & promote your products, all their main features and are capable of running competitions to catch the eye of potential new customers. Smaller blogs can also join the cause and push your brand through approved banners and other creatives. Content is arguably the most informative fighter of the group and can combine the detailed product story they relay with their wide reach and expert branding skills, to blast a Kikoken energy ball of informative and appealing content about any topic pulling the readers into the fray. They can however struggle to finish off the battle and can lose conversions to other publishers who sit lower in the funnel. Strengths: Branding, engagement, follower reach, influence! Fighting Style: The next fighter is the incredible Influencer, catching you off guard on your favourite social media channels and video streaming sites with their latest outfit of the day, hotel stay or shopping haul insta-story. These flashy publishers deliver campaigns that can create a real SONIC BOOM! A branding black belt, adept in the art of engagement and with extremely long reach, this publishers isn’t something to ignore, the Influencer’s strength in these 3 areas when combined creates some knockout campaigns. Each punchy post connecting straight to the chin and delivering instant feedback. Issue them with unique voucher codes to provide them with a cookie-less tracking solution and incentivise their audience, to unlock their true potential! Fighting Style: This multi vertical publisher has a time proven model that will work with almost any brand. The voucher publisher can dish out deals faster than the eye can see on a CPA model. They can Sumo wrestle with clearance sales, online codes and even in store vouchers, all at the same time and some even harness the support of their fan base to throw user generated deals around the ring and promote special offers. The Voucher publisher will finish you off with their rewards and gift cards offering where the user gets cash rewards or gift cards when they may make their purchase. The Voucher publisher may not be the most informative and they may traditionally be limited in terms of brand messaging but they are highly confident in their ability to offer serious brand exposure to an army of savvy online shoppers. The big, strong type, this publisher has top form on conversion closely followed by its reach. When the Voucher publisher wants to make sales and throw its weight around, get out of the way, this publisher will deliver a hundred hand slap barrage of bargain offers. 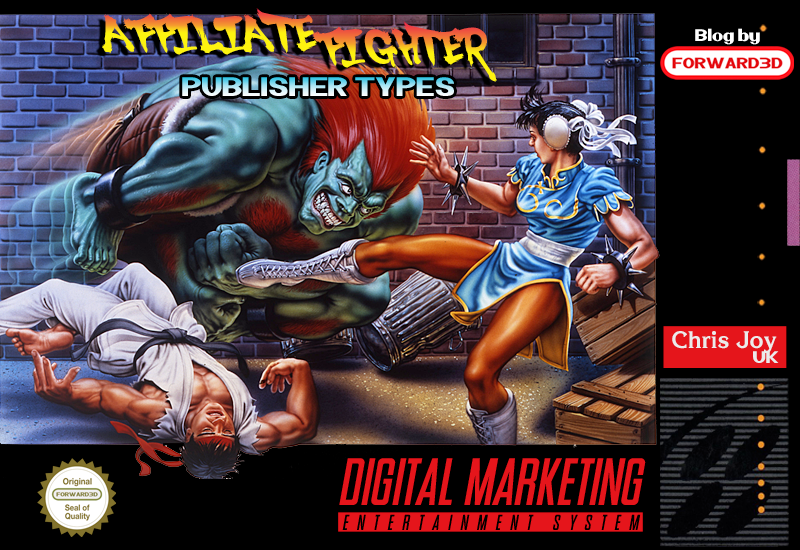 Fighting Style: The Aggregator publisher can cover all niches and verticals, all at once, delivering a strong arm that packs a Shoryuken punch full of product feeds, reviews and price comparisons. The Aggregator publisher is strong enough to carry 1000’s of sites products and services and shoulder throw users directly to your site. Whilst not as masterful at delivering information as the Content publisher, the Aggregator strikes its blows towards the middle of the funnel, thus making them that bit more effective at delivering conversions. Open up their moves list and you will find they can compare prices, give star ratings, pull reviews and group popular products. Aggregator’s can create price alerts to show the user price drops or to let them know that the product is back in stock. Fighting Style: The mysterious Loyalty publisher has many secrets to discover and offers that can only be accessed by signing your allegiance. The loyalty publisher has the strongest guard and defence of all publishers, getting close without joining this publishers risks certain and shocking push back. Not every consumer has access to this elusive yet highly rewarding publisher. For example, if your company or industry is connected with an employee benefits publisher, you can find yourself with access to unrivaled, electrifying offers. This big green monsters exclusivity and loyal audience gives them the edge over the competition. Fighting Style: Finally, we reach the big boss, the Cashback publisher. This powerful publisher can use a combo of promo codes, browser extensions with a final aerial fist dive right to the bottom of the funnel. There are other variations to this publisher beyond the standard cashback model, such as charity donation sites where commissions are passed forward to a customers chosen charity. The Cashback publisher can hit you with banners, blast you with emails, and grab your attention with on-site competitions and games. Other special moves include; free cashback for trial sign ups, hidden gems/easter eggs and friend referral rewards. Forward3D deploys all of these publisher types alongside one another, capitalising on their various strengths to create a full funnel strategy that fits your brand and business objectives. Want to talk to us about building the best affiliate strategy for your brand? "Street Fighter" is a trademark of Capcom USA Inc. "Street Fighter" images are (c) Capcom USA Inc.